I used to love watching Saturday Morning cartoons. And I remember being blown away when Launchpad McQuack (from Ducktales) became the sidekick/regular on Darkwing Duck. They can do that? It clearly laid the groundwork for my stoke when Worf appeared on Deep Space Nine. Oh Saturday mornings.. it’s been awhile since I got my geek on. Thanks for always being there for me. I think I need to go find a cape. Or a stick/sword and a garbage lid/shield. Or just revel in the gift of imagination that we all have inside of us, waiting to burst into flame again. 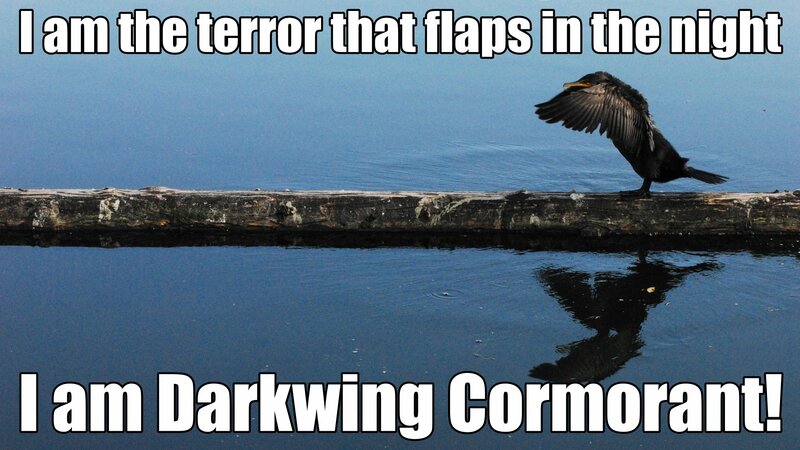 ps Cormorants are awesome birds. When drying their wings I’m always reminded of little dragons.